Nov. 5, 19:19 EDT: Mayor Michael Bloomberg got confronted by around a dozen of angry residents Monday as he was visiting hard-hit Manhattan Beach, Brooklyn. The residents complained about a continuing lack of power and heat. They also said they were afraid of burglaries. Bloomberg replied the NYC is trying its hardest to solve all the Sandy-related issues and added the residents could call 311 for directions to center where they would be provided with food and clothing. Nov. 5, 17:51 EDT: New York Gov. Andrew Cuomo says he will sign an executive order allowing displaced New Yorkers to vote in any polling place, reports NBC. Nov. 5, 16:25 EDT: The Federal Housing Administration has been ordered to suspend foreclosures in one of the US government's largest mortgage aid programs for 90 days in areas affected by Hurricane Sandy. "I directed all FHA lenders to impose a moratorium on any foreclosures for 90 days in disaster-affected areas. We don't want families to be victimized twice, once by the storm, and once by a forecloses," says US Housing and Urban Development Secretary Shaun Donovan. ­Nov. 4, 18:45 EDT: Fifty nine polling locations in Sandy-ravaged areas of New York City have to be moved or closed, according to Valerie Vazquez, a spokeswoman for the city's Board of Elections. Mayor Michael Bloomberg noted that some 143,000 New Yorkers would be affected by the polling station changes. Nov. 4, 10:40 EDT: Mayor Michael Bloomberg says the New York Board of Elections is not going to be left alone with the "real problems." Nov. 3, 18:30 EDT:Crews have safely tethered the dangling boom of a damaged midtown Manhattan crane to a luxury high-rise building. The crane collapsed during Superstorm Sandy, forcing people to evacuate the nearby buildings, including a hotel with 900 guests. Nov. 3, 18:00 EDT: New York City Mayor Michael Bloomberg says it may take a few days to fully resolve gas station shortages. "I know many NYers are frustrated about the availability of gasoline. We are making every effort to make more fuel available," he said in his Twitter account. ­Nov. 3, 12:20 EDT: Several Cabinet secretaries were heading to Connecticut, New Jersey and New York, the White House said on Saturday. Meanwhile, President Obama speaking at the Federal Emergency Management Agency said that "there's nothing more important than us getting this right." ­Nov. 3, 11:50 EDT: Some 2.5 million customers are still without power on Saturday, the US Department of Energy's Office of Electricity Delivery & Energy Reliability says. ­Nov. 3, 11:01 EDT: The New York City subway system is operating 80 per cent of its network, and more of it is set be put back into operation during the weekend, New York Governor Andrew Cuomo said on Saturday. ­Nov. 3, 10:35 EDT: New Jersey Governor Christie orders gas rationing in some counties to ease long wait times at gas stations and prevent a fuel shortage. The measure stipulates drivers with license plates ending in an even number to buy gas on even-numbered days, and those with plates ending in an odd number to buy gas on odd-numbered days. ­Nov. 3, 10:20 EDT: President Obama says there is still a long road to recovery and a lot of work ahead. Giving his last weekly address before the elections, the president promised to those affected by Sandy that the country will be there for them ”for as long as it takes to recover and rebuild." ­Nov. 3, 09:30 EDT: US death toll from Superstorm Sandy rises to 109, as Pensylvania and New York reported more casualties. Mayor Bloomberg warned that more fatalities may emerge as the clean-up continues. ­Nov. 3, 08:40 EDT: Polling sites in New York, New Jersey and other states hit by Sandy may need to be moved if power is not restored by next Tuesday's presidential election, officials say. Nov. 2, 23:50 EDT: US death toll from Superstorm Sandy rises to 106, according to CNN. ­Nov. 2, 20:10 EDT: New Jersey Governor Chris Christie has declared a limited state of energy emergency regarding the supply of motor fuel in 12 counties affected by Superstorm Sandy. "We're also implementing odd-even rationing for gas in these 12 counties," he said in his Twitter account. ­Nov. 2, 17:30 EDT: New York City cancels annual marathon in the wake of Superstorm Sandy. "We have decided to cancel the NYC marathon. The New York Road Runners will have additional information in days ahead for participants," Mayor's Office tweeted. Nov. 2, 13:46 EDT: Amtrak will resume regular service between Boston, NYC and DC on Saturday. Nov. 2, 12:23 EDT: NYC Mayor Bloomberg says Con Ed hopes to restore power to most of Manhattan by midnight on Friday. Nov. 2, 12:18 EDT: Michael Bloomberg tells reporters NYC marathon is "a way for people to show solidarity", but many are outraged that resources are being spent on organizing the event rather than helping locals. Nov. 2, 11:07 EDT: New Yorkers forced to wait for fuel in mile-long lines with hundreds of vehicles, as supplies run short. Nov. 2, 10:13 EDT: US death toll from Hurrican Sandy rises to 98. Nov. 2, 08:58 EDT: New Jersey will deploy military trucks to be used as polling stations on Election Day, to replace the polling places that have lost power. Nov. 2, 07:46 EDT: Federal Communications Commission says Sandy knocked out about 25 percent of cell sites on the East Coast; towers gradually being restored to service. Nov. 2, 06:55 EDT: At least 90 people have been killed by Hurricane Sandy across the US, as more dead bodies are discovered during clean-up operations. Nov. 2, 06:45 EDT: 900,000 people in New York will remain without power until November 11, while all of Manhattan’s lights will be back on by the end of Friday/Saturday, according to Consolidated Edison. ­Nov. 1, 23:05 EDT: Economic damage from Superstorm Sandy could reach as high as US$50 billion, forecasting firm Eqecat estimates. 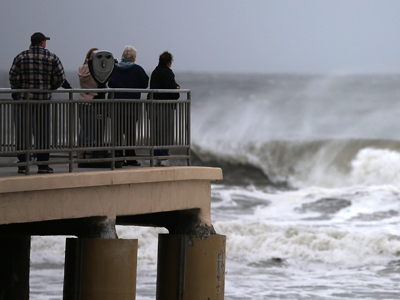 This would make Sandy the second most expensive storm in US history after Hurricane Katrina. ­Nov. 1, 20:25 EDT: The UN's management chief has said the global body’s headquarters in NYC has suffered “unprecedented damage” from Superstorm Sandy that has battered the city, AP reports. Yukio Takasu told the General Assembly on Thursday that the most serious damage was from flooding, which affected many basement offices and the cooling system in the main Secretariat building. The flooding also caused a small fire in a circuit breaker in an electrical panel in the basement, he said. ­Nov. 1, 19:00 EDT: The 43rd New York Marathon will take place Sunday despite the Superstorm Sandy aftermath. "This city is a city where we have to go on," Bloomberg said Thursday. He promised that the event will not drain resources from victims, "The marathon is not going to redirect any focus." Nov. 1, 16:20 EDT: New York Mayor and ex-Republican Michael Bloomberg has endorsed Barack Obama for re-election, saying Superstorm Sandy and climate change shaped his view. 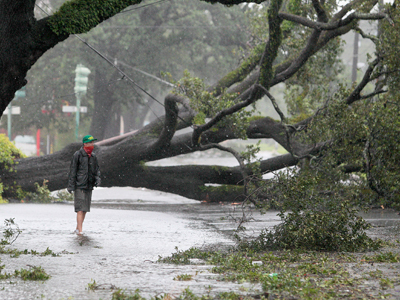 Nov. 1, 15:35 EDT: US Department of Energy says 200,000 customers have regained power, 4.5 million remain without. Nov. 1, 12:27 EDT: At least 82 people have been killed across the US and Canada. Nov. 1, 11:36 EDT: US death toll from Superstorm Sandy reaches 74. Nov. 1, 10:53 EDT: ConEd says power to be restored across Manhattan by Sunday. Nov. 1, 09:45 EDT: The first flight since Hurricane Sandy lands at New York's LaGuardia Airport. Nov. 1, 07:03 EDT: National Guard troops are evacuating patients of the New Your City’s Bellevue Hospital after flooding in the basement damaged its power generators and other equipment. A probe on Wednesday showed the damage was too extensive to keep it running. Nov. 1, 06:43 EDT: More than half of New York’s subway trains are back to working condition, according to local authorities. The trains are avoiding lower Manhattan, which is still dealing with a massive blackout. Nov. 1, 06:01 EDT: NY’s South Ferry Station remains flooded in the aftermath of Hurricane Sandy, as authorities work on clean-up operations. Nov. 1, 02:42 EDT: New York’s public schools to remain closed Thursday and Friday due to damage caused by Sandy. Nov. 1, 01:05 EDT: UN Security Council was forced to relocate its meetings on Somalia and other issues because of water damage to the UN headquarters caused by Sandy in New York. Earlier the UN press office issued a statement that the UN complex would re-open Thursday after a three-day closure. ­Oct. 31, 23:15 EDT: New York Governor, Andrew Cuomo says all mass transit fares will be suspended Thursday and Friday – making the subway, bus and commuter rail free. “I am declaring a transportation emergency and authorizing the MTA to waive fares…through the end of the week, Thursday and Friday” he said. ­Oct. 31, 19:00 EDT: President Barack Obama toured Sandy-devastated areas of New Jersey and reasserted the government’s support for any victims, saying “we are here for you, and we will not forget.” He also put aside politics to praise NJ Governor Chris Christie, a Republican and vocal supporter Mitt Romney, for his relief efforts. “I want to let you know that your governor is working overtime,” Obama said. Christie returned the kind words, later tweeting the he accepts Obama’s help and “appreciate his good will”. Oct. 31, 17:00 EDT: United Nations headquarters in NYC will reopen Thursday following post-Superstorm Sandy assessment. Oct. 31, 15:18 EDT: Bloomberg: "Our two biggest challenge remain getting mass transit and power grids up and running." Oct. 31, 15:07 EDT: Mayor Bloomberg: There were no storm-related deaths from any of the evacuated [medical] facilities in New York City. Oct. 31, 15:02 EDT: NYC Mayor Michael Bloomberg says only cars with three or more passengers should be allowed over bridges into Manhattan from 6AM to Midnight. Oct. 31, 13:55 EDT: Bellevue, New York's flagship public hospital, is relocating 500 patients after losing power. Oct. 31, 12:36 EDT: 59 people died in the US as a result of Superstorm Sandy; NY death toll climbs to 29. Oct. 31, 12:27 EDT: NY Governor Cuomo says limited subway service will return tomorrow, but not below 34th street. Oct. 31, 12:20 EDT: The U.N. Security Council has been forced to relocate its Wednesday meeting because of water damage to parts of the United Nations complex caused by Superstorm Sandy. Oct. 31, 10:08 EDT: NYPD says Sandy has claimed the lives of 22 people in New York City. Oct. 31, 09:32 EDT: NYC Mayor Michael Bloomberg rings opening bell for Stock Exchange, trading opens after 2-day shutdown. Oct. 31, 08:50 EDT: All bus services in New York City are operating free of charge today, says the MTA, as recovery efforts continue. Oct. 31, 08:37 EDT: Death toll from Superstorm Sandy has climbed to 55, according to the AP. Oct. 31, 07:10 EDT: Fire has broken out on the New Jersey barrier island of Mantoloking. Authorities believe a gas main exploded and the fire spread. Mantoloking was severely damaged during the storm. Oct. 31, 05:16 EDT: Russian airlines Aeroflot and Transaero have postponed their Moscow flights to and from New York City for one more day, citing bad operational conditions at JFK Airport. Oct. 31, 05:07 EDT: Barack Obama has canceled Halloween actives this year due to Hurricane Sandy. The presidential couple usually invites military families to the White House for festivities. ­Oct. 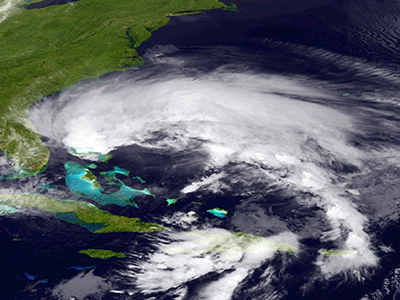 31, 4:57 EDT: The economic losses from Hurricane Sandy could measure up to $10 billion, Itar-TASS reported. Oct.31, 4:30 EDT: Hurricane Sandy is moving towards Chicago, with waves measuring up to 7 meters expected to hit the city. Oct. 30, 22:40 EDT: JFK and Newark Liberty airports will reopen for limited service on Wednesday. Oct. 30, 20:00 EDT: NYC Mayor Micheal Bloomberg says the city will be open for business on Wednesday with financial markets and businesses resuming work in all 5 boroughs. Oct. 30, 19:00 EDT: United Nations HQ in NYC will remain closed on Wednesday as the city struggles to overcome the aftermath of superstorm Sandy. Oct. 30, 18:08 EDT: The death toll from superstorm Sandy has risen to 40 in the US and Canada, with at least 18 killed in NYC, according to Mayor Bloomberg. Oct. 30, 18:03 EDT: At least 6,400 people remain in 76 evacuation centers, Mayor Bloomberg said, expressing thanks to the 2,900 people who are staffing the centers. Oct. 30, 18:00 EDT: NYC Mayor Michael Bloomberg says Sandy was a storm of historic intensity, but New Yorkers are resilient. The mayor expressed gratitude to first responders from the FDNY and NYPD. ­Oct. 30, 17:10 EDT: Limited bus services return to the streets of New York City, the mayor’s office has tweeted. Oct. 30, 16:40 EDT: Federal agencies in Washington will re-open on Wednesday after being shut due to Sandy on Monday and Tuesday, the US government says. Oct. 30, 15:35 EDT: An off-duty NYPD officer is among the 10 people killed by the storm in New York. The officer was reportedly getting his family to safety in their home on Staten Island when he got trapped in the basement and drowned. Oct. 30, 15:01 EDT: US President Barack Obama will travel to storm-stricken New Jersey on Wednesday to view damage, thank first responders. Oct. 30, 14:32 EDT: Schools in the US capital will re-open on Wednesday, according to the Washington Post. Oct. 30, 14:06 EDT: US death toll jumps to 38. More than 8.2 million people across the eastern US are without power. ­Oct. 30, 13:21 EDT: Alert remains in place at the Oyster Creek nuclear plant in New Jersey. Oct. 30, 12:55 EDT: New York Stock Exchange will reopen Wednesday after being shut down for 2 days. Oct. 30, 12:24 EDT: The Associated Press reports that death toll from hurricane Sandy has climbed to 33; many of the victims killed by falling trees. Oct. 30, 11:37 EDT: New York mayor's office confirms all bridges over the East River have been opened. That includes Brooklyn, Williamsburg, Manhattan, and Ed Koch Queensboro (59th Street) bridges. Oct. 30, 11:14 EDT: New York City Mayor Michael Bloomberg says at least 10 people died in NYC as result of storm. Oct. 30, 11:07 EDT: 750,000 New Yorkers remain without power, Mayor Bloomberg tells reporters. All public transport remains closed until further notice. Oct. 30, 11:04 EDT: New York City Mayor Bloomberg says Metro Trasport Authority CEO told him Sandy is the worst natural disaster in the subway's 108-year history. Oct. 30, 10:55 EDT: All three airports serving the New York City area – JFK, LaGuardia and Newark – remain closed. Airports in Boston, Philadelphia, Baltimore and Washington DC are open. 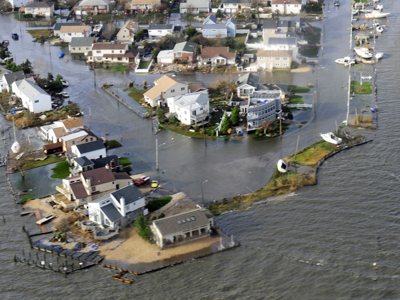 Oct. 30, 10:39 EDT: New Jersey Governor Christie says 2.4 million households have been affected by Sandy – twice the number from Hurricane Irene in 2011; over 5,000 people have been placed in shelters. Oct. 30, 10:36 EDT: New Jersey Governor Christie: "The devastation is unprecedented – like nothing we've ever seen reported before." Oct. 30, 10:23 EDT: NJ Governor Christie said the state of NJ is working with the Salvation Army and Red Cross to bring in mobile kitchens. He also said the state is utilizing FEMA food and water resources. ­Oct. 30, 10:21 EDT: In a press conference, NJ Governor Chris Christie said there is major damage on each and every one of New Jersey's rail lines. ­Oct. 30, 09:54 EDT: MTA chairman says New Yorkers should expect mass transit to return “in pieces and parts” in the days to come. ­Oct. 30, 09:51 EDT: Sewage is flowing into the main stem of the Little Patuxent River in Savage, Maryland at a rate of 2 million gallons per hour. Officials say a power outage at a water treatment plant is to blame. ­Oct. 30, 09:37 EDT: NYC metro, rail, and bus service to resume on limited schedule (Sunday service) at 2pm EDT. ­Oct. 30, 09:22 EDT: Officials say the fire in the Breezy Point section of the Rockaway peninsula in Queens involves 80 to 100 homes. A fire department spokesman says nearly 200 firefighters are currently at the scene. ­Oct. 30, 09:15 EDT: MTA chairman says all seven subway tunnels that connect Manhattan to Brooklyn & Queens are flooded. ­Oct. 30, 08:51 EDT: At least 5,751 flights have been canceled in North America for Tuesday, around 15,500 flights have been affected by the storm. ­Oct. 30, 08:23 EDT: Since midnight, 911 has received 8,362 calls. 4,807 calls are waiting to be answered. 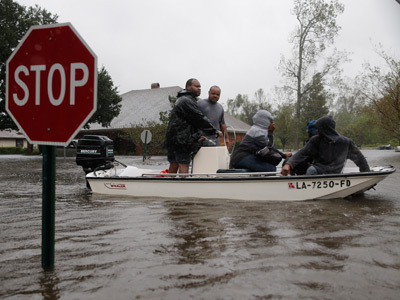 Oct. 30, 08:03 EDT: The Red Cross reported that nearly 11,000 people spent Monday night in its shelters across 16 states. ­Oct. 30, 07:55 EDT: Power company Con Edison is reporting 684,000 customers without power in the New York City area. Oct. 30, 06:40 EDT: Damage costs estimates to exceed $20 billion in US alone. Oct. 30, 06:04 EDT: Post-Sandy forecast predicts five days of rain, according to National Weather Service. 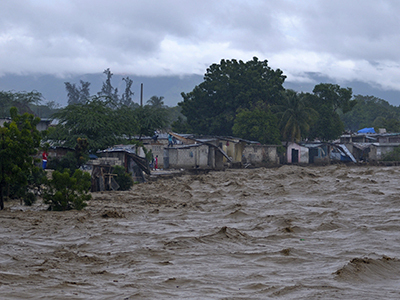 Oct. 30, 05:59 EDT: Total of 83 people killed by hurricane Sandy: 15 in US, 1 in Canada, and 67 in the Caribbean. Oct. 30, 05:44 EDT: President Obama declared hurricane Sandy “major disaster” in New York. Oct. 30, 05:20 EDT: Sandy death toll rises to 16 people in US.